You know it's fall when those cranberry commercials pop up on the tv! 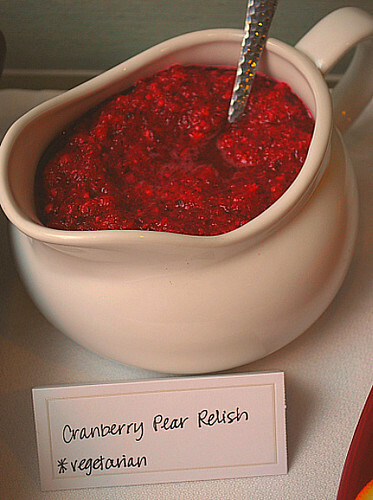 Thanksgiving isn't complete unless cranberry sauce is on the table and so I had to include something prepared with cranberries on our Regional Thanksgiving menu. I was actually surprised to learn that the state of Wisconsin is a major cranberry producer in the United States. 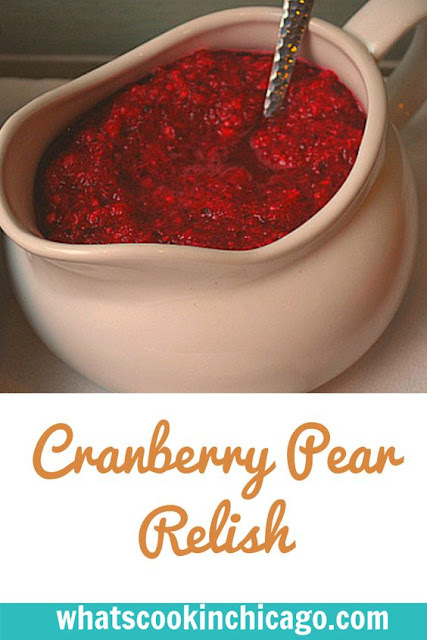 With that, the following recipe represented the state of Wisconsin and involves a great variation of cranberry sauce. This recipe is extremely simple... and can be done well in advance. I found that the more it sits, the better the flavors. Even better is that this recipe doesn't require any cooking! All you need is a food processor to whiz everything up. Wash and dry the orange. Cut the orange into small wedges, removing the peel, and put in a food processor. Add the cranberries, pear, sugar, and salt. Pulse until coarsely chopped. Transfer to a bowl, cover, and refrigerate for at least 2 hours and up to 2 days. Just before serving, stir in the pecans if using. You have good taste. Tyler has some gems and this looks like one.